Quick dry aids like sprays and drops help the solvents in nail polish evaporate more quickly than normal. NAILS spoke to industry scientist, Doug Schoon to find out the basics behind the formulas that speed up the nail polish drying process. NAILS: How do quick dry drops and sprays actually work? Doug Schoon: There are thickeners in the nail polish that keep the nail polish thick. When the nail polish is applied, the solvents evaporate and the thickeners settle and flatten out on the nail. This makes the nail polish layer become thinner and eventually dry to the touch in about 10-15 minutes. That’s what normally happens without using a polish dryer. 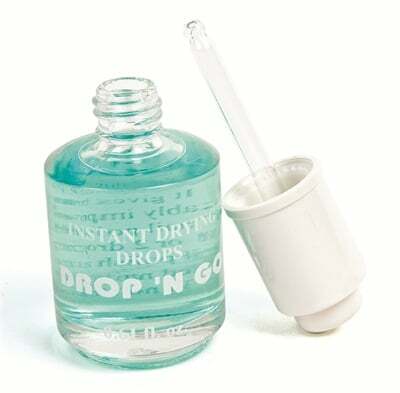 Quick dry nail drops are basically another type of solvent, but one that doesn’t dissolve the nail polish. When applied, the drying drops don’t attack the surface; instead they absorb the solvents in the polish to speed up drying by about 10-15 minutes. So basically, the drops speed up the entire process. NAILS: What types of ingredients should you look for in a quick dry spray or drops and why? DS: Most manufacturers use silicone materials like cyclomethicone or dimethicone, because they don’t dissolve the polish. These types of silicone-based products are great nail polish dryers. Some natural oils also act as dryers. The ones chosen are picked because they don’t mess up the surface of the nail polish and they absorb nail polish solvents to speed drying. Also, these are better than using a blow dryer since heat can cause these solvents to evaporate too quickly and the polish may dry unevenly, which can reduce shine and durability. NAILS: What effect does it have on the nail plate, if any? DS: The quick dry drops or sprays do not affect the nail plate because the polish acts as a barrier. They don’t actually touch the nail plate. Even if they did, these ingredients are very safe for skin contact. DS: Different people use different silicone blends. There are so many types of silicones to choose from but blends of natural oils and silicones are ideal — as long as it doesn’t mess up the surface of the nail plate and absorbs the solvents. NAILS: Are there different kinds of quick dry spray and drops? Are there some that provide other benefits like conditioning or strengthening? DS: There are many formulations and many substances used as dryers. All of these are likely to be good for the surrounding skin and may even condition it. Some of the dryers leave the nail looking shiny and polished and have other visual benefits. The main effect of these kinds of products is that they speed up the drying process. It’s not going to make the nail polish adhere any longer, nor can they strengthen the nail; these types of products simply make nail polish dry faster. NAILS: What are some of the differences between the spray and drops? DS: They both function the same; it’s just a matter of preference and different application. NAILS: What’s the ideal method of application? DS: The main thing is to follow directions. The directions are there to show you how the product should be used. If you have questions on how to apply it, call the manufacturer. Be cautious of where you spray the product or use the drops. Unless it’s applied in a controlled fashion, most of it will not go on the hand and it can contaminate implements or settle on the nail tip tray in the surrounding area. This can cause service breakdown and contamination, possibly dooming nail coatings or tips to not properly adhere and lead to lifting. Also, make sure the dropper does not come in contact with the client’s skin. This rule applies to every dropper used in the salon, but especially for oils dispensed by droppers, to make sure you don’t contaminate the product with bacteria. NAILS: Any advice on how to pick out quality quick dry aids? DS: You should use the nail dryer designed for the nail product of your choice and follow directions. Don’t just like a product because of the way it smells or looks. Give them a good test run and follow directions. If you want the nail polish and skin surrounding the nail to look beautiful, it’s better to select professional products and use them the way they were intended. That’s what the instructions are for. Make sure you’re using all nail products correctly, including polish dryers. NAILS: Can nail dryers be used with top coats? DS: I think nail techs should use top coats. Some might want to use the dryers to cure the top coat. I recommend using a top coat that is designed to be paired with a quick dry spray or drops. Typically, they are not designed to work together.